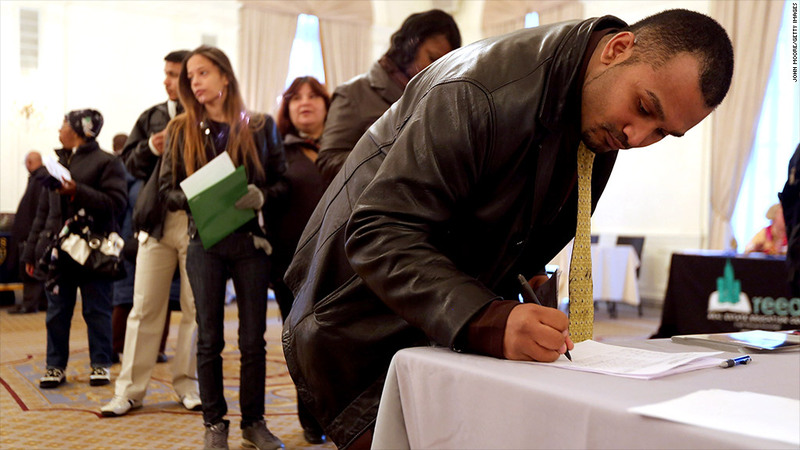 The number of newly unemployed seeking jobless benefits fell more sharply than expected last week, taking a key reading to its lowest level in more than four years, the government reported Thursday. There were 350,000 filing for initial jobless claims in the week, down from the 362,000 who sought assistance a week earlier. Economists surveyed by Briefing.com had forecast 375,000 would be seeking help last week. The four-week moving average, which economists prefer to look at since it smooths out the volatility in the weekly numbers, fell by 11,250 to 356,750 last week, as a spike in claims in the wake of Superstorm Sandy faded into the background and the labor market continues to show signs of improvement. That four-week average is now at the lowest reading since the week that ended March 15, 2008, shortly after the start of the Great Recession. The average over the course of 2012 has been about 375,000 a week seeking help. Superstorm Sandy caused a sharp rise in claims as many businesses in New York and New Jersey were forced to close temporarily due to damage or loss of power. But claims basically returned to pre-storm levels by early December. The report also showed 3.2 million people filed claims for their second week or more of jobless benefits during the week ended Dec. 15, down 32,000 from the previous week. Next week, the Labor Department reports how many jobs employers created in December. Economists are expecting a net gain of 150,000, nearly identical to the average monthly gain so far this year. The 1.7 million jobs added so far in 2012 has helped to lower the unemployment rate to 7.7% in November from 8.5% at the end of last year.